Since I made a comment about “energy spoons” on Facebook, I have had several comments on Facebook and in e-mails just what that is. Since I mention this phrase quite a bit, I thought it would be good just to re-post the article where I originally talk about it. 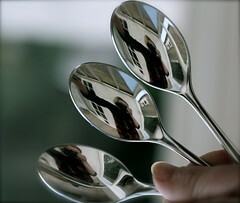 So, here you go The Spoon Theory, originally posted 2007 on KMGN. Many people throughout my life have asked me what it was like to be me, a person with a disability. Even though I told them I hurt somewhere every day and some days were worse than others, they would nod, but it was quite plain to see by the look in their eyes they didn’t get it. It wasn’t them, of course, and it wasn’t me. It is impossible in many respects to explain what it is like to be disabled/handicapped; it is just as impossible to explain what it feels like to be black, Asian, or just plain white. For many years I didn’t even try to explain it because I had grown quite accustomed to the looks in their eyes when they didn’t get it, and if I attempted to explain it at all it would be only to the people who genuinely seemed interested in wanting to know. These people were usually my closest friends, or those on the border of becoming a close friend. Still, despite their desire to understand, they couldn’t, and they seemed, looked sad because they couldn’t understand. Recently I made a comment to a friend about feeling tired. He said, “So you’ve run out of spoons for the day?” I didn’t understand what he meant. “I read something that sort of explains to me how you are. I’ll find what I read and send it to you in an e-mail link. He was good to his word and sent the link to me, and now I am passing it along to you because it does explain what it feels like to have a disability. This woman has Lupus, which, according to the Arthritis Foundation web page, is lumped in with arthritis. I have rheumatoid arthritis so the fatigue she talks about and how you have to plan and that your back-up plans have back-ups are quite accurate. This entry was posted in 2013, arthritis, bad days, beautiful, celebrations, dance, doctors, dogs, family, friends, good days, good times, health, I feel, IMPORTANT, instruments, life, links of interest, marriage, music, pain, poetry, stories, the internets, wheelchairs, Writers, writing. Bookmark the permalink.